Error 2330 is an iTunes-related issue that occurs when you try to uninstall iTunes. The error could be caused due to a number of reasons. A complete uninstallation of iTunes and all its related components is needed in order to solve iTunes uninstall error 2330. Fortunately, there are a number of ways to completely uninstall iTunes. iMyFone TunesFix offers one of the best ways to completely uninstall iTunes. This professional iTunes repair tool has a dedicated mode for this specific purpose only. You simply need to use the Full Uninstall mode of TunesFix and the software will automatically uninstall iTunes and all its related components in the right order. So you won’t have to worry about finding and uninstalling each component of iTunes one by one and the iTunes uninstall error 2330. This is the reason many iOS users prefer TunesFix to uninstall iTunes. Completely uninstall iTunes as well as all its related components in the right order. Advanced one-click solutions to 100+ iTunes issues. Automatic scanning of various iTunes issues. Several powerful manual repair modes for specific iTunes issues. Your data in iTunes library is not deleted when fixing iTunes issues via TunesFix. Step 1: Open TunesFix on your computer. Step 2: Let the automatic scanning process of TunesFix complete. In case a problem is detected, fix it by using the Repair button. If no problem is detected, then TunesFix’s home screen will open. Step 3: From the home interface of iMyFone TunesFix, select the Full Uninstall mode. Step 4: On the next screen, check the delete user data option if you wish to delete iTunes media, backups, junk files, updates, etc. along with the uninstallation. Click the Uninstall button to proceed. 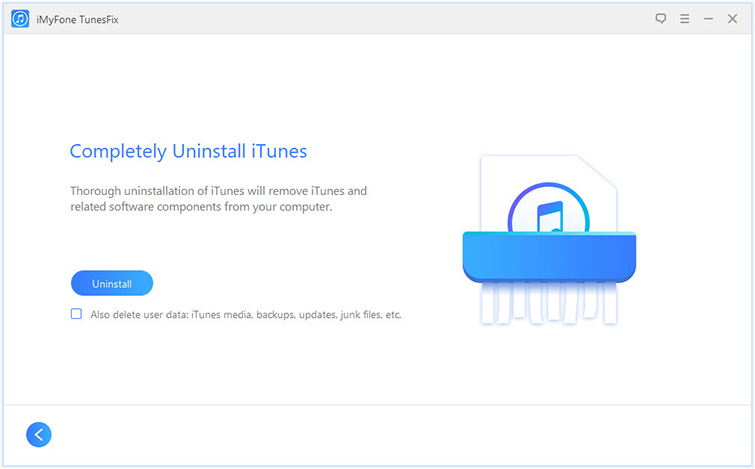 TunesFix will now start uninstalling iTunes and its components. Click the OK button when the uninstallation is complete. You can manually uninstall iTunes and all its components one by one and remove any traces/fragments of iTunes from your computer. It will solve the error 2330, but it is a relatively lengthy process. You will also need to uninstall iTunes components in a specific order to succeed. Step 2: Now uninstall iTunes and all its related components (Apple Mobile Device, QuickTime, Bonjour, etc.) one by one. Step 3: Restart your computer after uninstalling all the components. Step 4: Now visit the official website of Apple and download the latest version of iTunes. Step 5: Once the download is completed, run the installer setup and then follow the on-screen instructions to install iTunes on your computer. 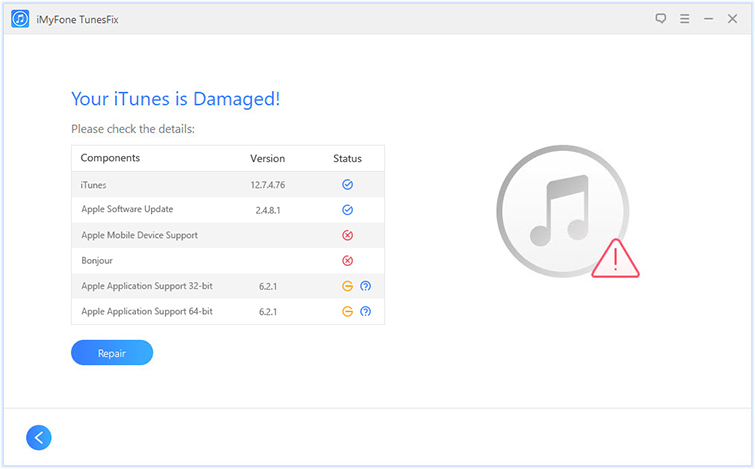 iTunes uninstall error 2330 can also be caused by the language folder of iTunes. Fortunately, you can resolve the issue quite easily by cleaning out the different parts of your system. Step 1: On your Windows PC, open File Explorer. Step 3: Now rename this folder to something other than its existing name. The corruption in ‘registry’ of your Windows PC is one of the biggest causes of problems such as error 2330. This is a part of the Windows OS where various important files, options, and settings of the system are kept. A corruption in registry may prevent the system from operating smoothly. According to some users, the iTunes uninstall error 2330 is caused by the corruption inside the iTunes-related registry files. That’s why it is recommended that you clean out this part of Windows to solve the problem. In conclusion, the iTunes uninstall error 2330 could be caused due to a number of reasons and there are a number of ways to fix this error. You can fix this error by completely uninstalling iTunes via TunesFix, cleaning out the registry of Windows, renaming the language folder for iTunes installation, and manually uninstalling and re-installing iTunes. When you compare all these methods, it is quite easy to conclude that using iMyFone TunesFix to uninstall iTunes is the most convenient method because it requires relatively less time and effort. So it is recommended that you try TunesFix first before trying other methods to fix error 2330.